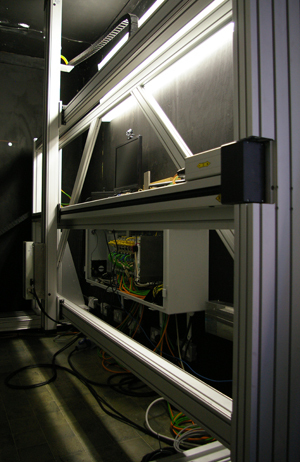 AA&R's London office operates a novel 5-axis scanning system with a modular imaging and in-situ analysis capability. It produces stunning gigapixel images with consistent spatial resolution to provide direct comparisons between different paintings by the same artist. These ultra high resolution images allow us to examine very small details, enhancing the level of interpretation possible on technical images such as infrared and X-rays. The system was developed with the need for "inter-comparability" in mind, which allows us to maintain a consistent high level of resolution, no matter what the size of the painting (unlike many IR systems, which have a set resolution, resulting in high resolution for small paintings, and low resolution for larger works). We provide images of comparable resolution across the range of imaging techniques, creating images that are ideal not only for studying a range of illumination sources used on a single object, but which come to the fore in the study of multiple works by providing the most closely comparable documents possible. Digital X-ray - A 90kV microfocus source and 14-bit TDI detector provide the highest spatial resolution currently available on commercial digital X-ray systems and is superior to traditional film based X-rays. This system helps reveal hidden features such as artists' alterations (pentimenti) and painting technique, as well as providing important information on the condition of a work of art by showing losses, restoration, worm damage and other types of change. It greatly enriches the historical study of artist's supports: for example, the examination of "cusping" (stress distortions produced when a canvas is stretched) can help establish if a painting retains its original form of if it may have been cut down or enlarged. X-rays of panels can bring to light details such as methods of joining and panel construction. We can also use digital X-rays may as the basis for undertaking computer-generated thread counting (also known as "weave analysis"), a method that allows for the highest degree of accuracy for studying painter's supports. Infrared reflectography - We operate both InGaAs and Silicon CMOS camera systems which allow us to produce high resolution infrared images at multiple wavelengths. Such images enable us to study painting features such as underdrawing and methods of priming, as well as providing a complement to X-ray images, often comprising information about an artist's methods in developing a composition. Transmitted infrared - By placing an infrared light source behind the painting and scanning it and the camera across the painting we produce infrared images which may reveal hidden features such as canvas stamps, collection markings or inscriptions on relined paintings. This technique may also reveal earlier pictorial compositions. Ultra-violet fluorescence - By capturing the visible light emitted from the painting surface under ultra-violet illumination we can reveal features such as the presence of restoration. Colour imaging - The scanner allows us to produce colour images of unparalleled accuracy and detail. With a resolution exceeding 1,000 dpi we can see fine details of brush strokes and craquelure.